The serval is a wild African cat. The name "serval" means "Wolf Deer". For those who have never seen a serval, you can describe it as looking like a small cheetah. They have many similarities, but if you examine the serval you can see the differences in many ways. The serval can seem to have a weird combination of behaviors. If domesticated, they can act like normal house cats. Another strange attribute of the serval is that when it lies down, it sprawls its legs out much like a dog would. 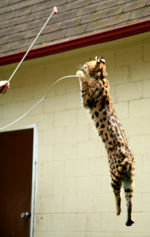 The serval also likes water unlike the majority of cats. The serval is most known for its long legs. This aids them in capturing their prey. They also use their long forearms to reach into rodent holes. Although they look like cheetahs, they aren't as fast as them. Their legs are mainly for reaching, but they are strong and agile. They have been seen catching birds in flight up to almost 15 feet in the air straight up. It seems impossible, but it has been noted. The adult serval is about three feet long and is approximately 24" tall at the shoulders. It has a slightly disproportionate body with its head being slightly small in comparison to the rest of its body. It has very large ears, sitting closely together. Its neck, stretched forward, looks strangely long, and its tail is slightly shorter than most spotted cats. Strangely enough, the serval is very elegant looking. The serval reaches sexual maturity at the age of 18 months. They do not have a specific mating season. The females have a gestation period of about seventy-five days. 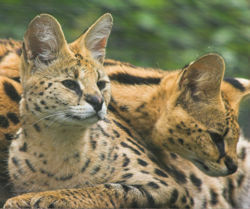 The serval can have up to five serval cubs. The normal is two to three cubs. The female is able to get pregnant up to fourteen years of age. When the mother gives birth, she rears her cubs in a den in dense vegetation or in an abandoned burrow. They are very easy to breed in captivity. There are many combinations of serval breeding. The most common is a male serval and a domestic cat. These cats are called Savannahs. Servals live in Africa. Their main habitat is the savannah, but they also live in more forested areas with a constant water source. They do not like heavily forested areas. They eat rodents, hares, ground squirrels, hyraxes, snakes, lizards, frogs, insects, small antelopes, and birds. They also have been seen working together with another serval to bring down ardvarks. The males are the ones that do this the most. Otherwise, servals are very solitary. When hunting, the serval will sit and listen for movement. Their ears are so acute that they can hear animals underground. They will, then, dig for it and pull it out. They are usually seen wandering in tall grass, sometimes running in zig-zags. This page was last modified on 16 August 2010, at 07:01.